Relativistic lattice | Coding on acid. Back in February 2014 I have discovered that, unlike what these scary papers and presentations might make you think, programming this kind of ray tracer is really straightforward. Since then, I was contemplating doing this on GPU, but AGAL kind of sucked and I knew zero GLSL to even start. A year later, I have found this shader and decided that it looks promising, but its performance sucked on every piece of hardware I own, and I had to look for the ways to make it work faster. This did not go well, again, and I have lost my motivation soon. But now, when the hard part is done, it was simply a matter of combining all the parts together – and so I did. (for events connected by light rays both sides are zeroes). The number of conclusions you can draw from this alone is fantastic. For example, if observer 1 is our spaceship, and events are its departure from Earth and arrival to some distant world, we have X₁ = 0 and X₂ = spaceship velocity times T₂ – therefore T₁ ≠ T₂ – the conclusion known as “twin paradox”. It also says that you could reach any place in the Universe in just two weeks if you fly sufficiently fast (but still slower than light), and – yes – I made space traveller calculator for that. Any way… to be continued. Good point. Although physically impossible, it might be possible to calculate what “unphysical” observer would see. The code “as is” will fail because of square root, and maybe other things, but I will think about alternative approach. This is a great effect. We usually see beams of lights passing by the cockpit like in Star Wars movies http://furiousfanboys.com/wp-content/uploads/2010/12/hyperspace.jpg, that simulate the “speed effect” distortions. We rarely have the chance to appreciate a well put together effect of that event. Will it be difficult to include your work into a generalized THREE.js postprocessing shader? 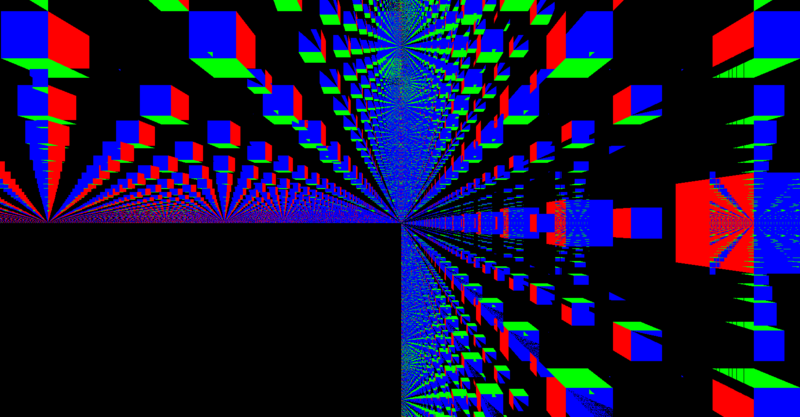 Nearly impossible, I guess, unless you do some clever pre-transform in all vertex shaders. Because your postprocessing shader would need an access to the back side of the objects which is invisible when v = 0. It might require complex mathematical formulas above my understanding. I guess users will have to content themselves of a “fake” effect emulation, the same as one will see through a Fresnel lance. Anyway, thank you for the info and the demo.